Gamers everywhere are counting down the final hours to the final release of Halo 3. Tonight’s midnight release may very well be the most-hyped event yet in video game history, with tie-in marking from every angle from action figures to caffeinated drinks. I’ve heard that Bungie and the XBOX LIVE team expect the cumulative time spent playing Halo 3 online — all players combined over the next few years — to be over a billion hours. The multiplayer experience, with groups of players battling online, is what a big part of what brings so many to Halo and similar games. For me, and for many of my friends, our first stop won’t be multiplayer. First things first, you know. Our goal is to “finish the fight,” completing the story arc that has its third act in this newest version of the game. As the Master Chief hurtles Earthward in a Forerunner spacecraft, he may be our last chance to stop the Covenant, the Flood, and the ticking time bomb that is the Halo network, before every last soul in the galaxy is destroyed. The stakes have never been higher. 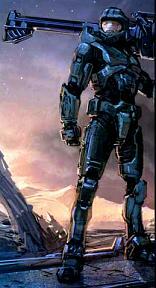 Heck, Halo 3 might even end the war in Iraq.